I recently stumbled upon a One Piece pic which left me dumbfounded. In the picture below you can clearly see that 2 Zoros appear at the same time, being a One Piece fan myself I wasn't able to remember when that happened. Does any of you guys in which episode (or special or movie) did this happen? This appears to be an animation error from an earlyish episode when that was more frequent. 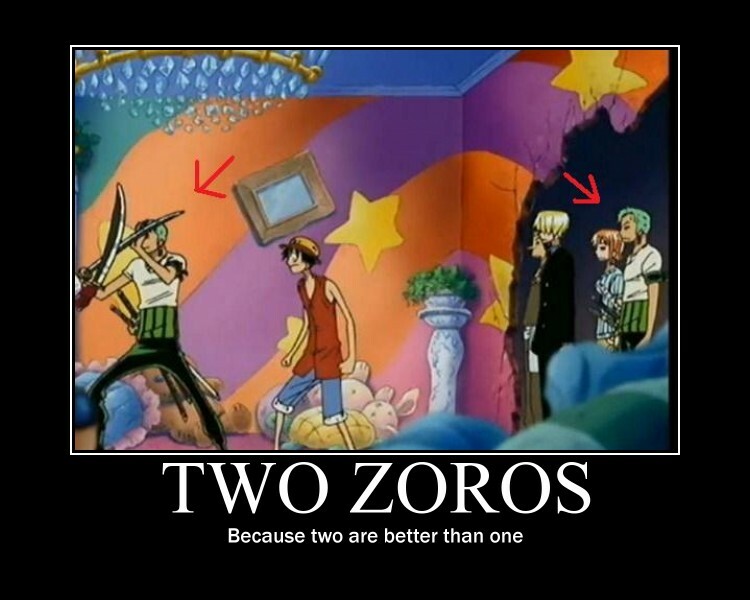 Specifically it comes from Episode 226 which is part of the Foxy Pirate Crew Arc. In this scene Zoro is fighting Foxy the Silver Fox in (a bad) disguise to the left hand side of the screen and also (apparenly) calmly standing there watching the silly fight. What story are the two new admirals based off of? Which devil fruit is this, and what happend to it? Which episode to start watching One Piece from to see Ace and WhiteBeard getting involved? In which episode of the anime did Aokiji (Kuzan) and Akaino (Sakazuki) fight? In which episode did Luffy say the following quote? What episode does this particular scene with a Takoyaki “song” occur? In which episode does Luffy get his finger stuck in a bottle?